Sometimes I think the best gifts are the ones that are thoughtful AND super simple. Sometimes the simple ideas are the most obvious and I over think an idea, making it entirely more complicated than it needs to be. 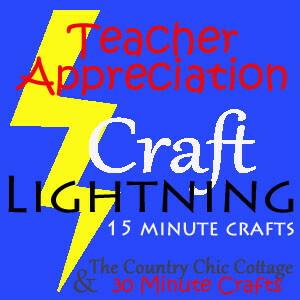 So today I am sharing a little quick gift inspiration specific for teacher appreciation. You don't have to spend a ton of cash to make a gift that is unique and meaningful. I've created this fun word art print that you can print out frame to give as a gift for your favorite teacher. You can decorate this teacher appreciation word art however you like. Print it on colored paper, add your own coloring, or leave it as is. I added a strip of glitter pink washi tape to the top and bottom of the print before I framed it. The whole thing took more time to print than it did to put it all together. I'll admit, the frame used to be brown wood, so actually I spent more time painting the frame than I did creating the rest of the teacher gift. You can also make your own coordinating teacher appreciation card with a freebie download I designed. Today's project is another make it yourself gift idea I am sharing in the Craft Lightning series with The Country Chic Cottage and 30 Minute Crafts. Go check out all the great Teacher Appreciation projects Angie has lined up this week! This is such a fun printable (as always) – and I love the version on the card! !